"Savitri Pharmacueticals” no longer existed . However one of its erstwhile partner had floated & started a new company naming it as “HARSHUL AYUR PHARMA” in the year 2006, which has been granted a license to manufacture ayurvedic medicine/drugs. " In developing countries contaminated food, water, unsanitary enviro-nment and unhygienic manner of living due to illiteracy, consumption of alcohol etc. are some of the main causes of liver ailments. These ailments include Jaundice, Hepatitis, Cirrhosis of liver which results into anorexia, mild fever, nausea and vomiting, oedema on foot, pruritus, debility, anaemia and constipation (1). There are a large number of drugs which are mentioned for providing relief in different liver disorders, while it is certain that modern drugs are inadequate in this area. However, traditional systems have the possibility of offering new drugs. While looking for some new leads for useful drugs for various kind of liver ailments, the attention of ours was drawn to the ealy results of herbo-mineral formulation for liver disorders, prompted us to undertake the present study. The Traditional recipe shows that powerful activity was present to correct and cure various liver ailments. 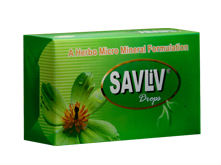 It was in use in Nainital District of India, since long time and almost same type of ingredients were included in the proprietary medicine “savliv” manufactured by Savitri Pharmaceuticals, Ramnagar Nainital, India. The Traditional herbomineral recipe is a fast acting powerful hepatic stimulant. It increases the functional capacity of the liver, accelerates cellular metabolic activity and promotes regeneration. It has been reported (manuscript 1987) to bring remarkable improvement in appetite within 15-30 minutes of its administration, gain in body weight and enhanced feeling of well being in the management of malnutrition. The traditional drug is used as corrective and curative for enlarged and fatty liver. The ingredients mentioned [Citrus medica (aurantifolia) fruit juice, Sarjika, Cypraea moneta (Varat)] in traditional recipe are not new, These are in use since the days of Charka and Susruta (2000 B.C.) and have been found to be as efficacious as these occurring in the ancient treatises “Cankha Bati” (2) (an official preparation) and many other formulations. Pills of “Cankha Bati” reported to cure loss of appetite, indigestion, abdominal dropsy, intestinal worms, mucus cough, asthama, consumption of excited wind, sour bile and other ailments, it enkindles the digestive fire. Sidha system of medicine is very particular about the use of conch. The sacred conch occupies as important place in the lives of Hindus, being used in worship, conch are purified by immersing in the lime juice and then used for preparation of medicine. Only very limited study has been made on the traditional medicinal values of the Cypraea moneta (Varat) obtained from the Ocean (3). The recipe was prepared form C. medica (auran.) juice, which was first boiled, in order to coagulate and precipitate protein like matter and then neutralized with a requisite weight of Sarjika and Cypraea moneta at 30o C. Recipe takes 5 days for its preparation. It was a white milky suspension.10.0 g. of the traditional drug suspension were taken in a silica crucible previously ignited, cooled and weighed. The sample were ashed in a muffle furnace at 600o C until the ash is free from carbon. The crucible was weighed after cooling. Accurately weighed ash is moistend with a small amount of distilled water (0.5 ml). Then mixture was evaporated to dryness on a boiling water bath. Ash was again digested with 5.0 ml of hydrochloric acid near to dryness and 2.0 ml of hydrogen peroxide (analytical grade) was added. The digested material was diluted with deionised water in a 100 ml flask to the volume. The sample ash solution, in suitable aliquots, was then used for various analytical determinations. The minerals Calcium, Sodium, Potassium, Magnesium, Iron, Phosphorus, Chloride, Sulphate were determined in accordance with standard methods (flame photo metric, spectro photo metric, volumetric and gravimetric methods) reported in the literature (12) . The chemical examination and laboratory findings of the recipe shown in the Table2, revealed the presence of Sodium, Potassium, Calcium, Magnesium, Phosphorus, Chloride, Sulphate, Iron and Citric acid. All minerals appeared in the drug from its natural resources of ingredients. Most of the Calcium and Phosphorus (Table1) have come from Cypraea moneta (from Ocean) which is natural source of bio-calcium and Phosphorus. An effective medicine prepared from natural sources should therefore find high level of acceptance for patients of hepatic disorders. These minerals are essential for the proper growth of the body, and form a constituent of all extracellular fluids, various digestive juices (Table3), inorganic salts of bile and tissues notable to the nerves, blood and muscles. Perhaps the citric acid of the traditional drug enters into the TCA cycle. The citric acid cycle is one of the most important biochemical mechanism of oxidation of the activated metabolites and it is the major terminal pathway of biological oxidation in all animal tissues. The activated metabolites derived from carbohydrate, protein, and fat, are oxidised by the electron-transport chain and most of the utilizable energy (ATP) are produced for the organism (13). The investigations are preliminary and much study is required to verify its validity by means of biochemical examinations and Liver function tests. The evolutionary process that led to selection of Calcium and Phosphates as major cytoplasmic components and many cellular reactions are dependent upon the availability of organic and inorganic Phosphates. Phosphate functions as major cytoplasmic buffer, the basis for energy exchange and an essential components of memberances, and nucleic acid. Further the major constituents of herbo-mineral recipe has been shown to be primarily responsible for various physiological and metabolic effects and significant hepatoprotective activity. Traditional drug has proved a boon to the patients with liver ailments, either viral of toxicity of antibiotic, alcohol and other synthetic drugs. Today the problem of using drugs is that probably modern drug carries a certain amount of risk of toxicity, when administered. In this regard this recipe has advantages of using substances with which the system is already familiar. There is a wide scope of such preparation for global implications in Hepatic disorder. It is certain that traditional system drugs and their ingredients have been used for thousands years and therefore the sanction of the use for long period is on their side. Traditional recipe may provide a new impetus to researchers and help to find new products to combat deadly hepatic viruses responsible to set untimely death. 1. To keep the electrolytic balance in dehydration. 2. To be used in Anaemia, Jaundice, due to its ingredient effective and essential in the disorders of Haemopoietic system. 3. In viral fever, Dengu fever the recovery was very fast probably it provides an impetus to the immune system of the body. 4. Due to its effect on promoting the immune system of the body it may be an adjunct to the patients of A.I.D.S. Tuberculosis, Cancer. Thus an indirect help to combat these diseases. 5. There are very limited medicines for Hepatic disorders, viral Hepatitis etc. (Dr.B.N. Tandon, Ex. H.O.D. Gastro enterology A.I.I.M.S New Delhi, Personal Communication). 6. Calcium and Sodium Citrate (l6) are good diuretic and diaphoretic, thus helps to check pyrexia, without disturbing the heat regulating centres (Hypothalamus). 7. An adjunct during chemo-therapy, antibiotics etc. to safe guard the liver against toxicity of chemical based synthetic drugs. 8. W.H.O., UNICEF are sponsoring World Wide Vaccination of Children. This type of traditional recipe should be added for “UNIVERSAL SAVE LIVER PROGRAME” and check child Mortality. The technology to manufacture this recipe is not very much complicated The herbal ingredients are safe like the milk and food, easily available in tropical countries from natural sources. We are grateful to Dr. Yasuo Otsuka, Chairman, and Professor Shizu Sakai, Secretary ICTAM IV for their help and encouragement. One of the author wish to appreciate sincere gratitude to the arthorities of Gurukul Kangri University, U.G.C. D.S.T. and INSA, Government of India, New Delhi for providing necessary facilities and financial assistance. The co-operation and help rendered by he Prof. D.K. Maheshwari, Dean Faculty of Life Sciences, Gurukul Kangri University, is acknowledge gratefully. Thanks are also due to Dr. R. Goswami, Principal, State Ayurvedic College, Gurukul Kangri for providing the facilities for this study.